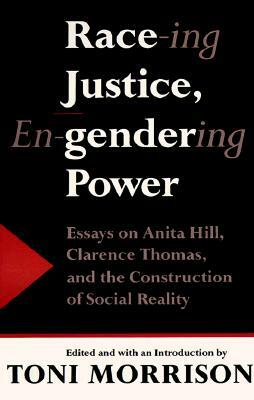 It was perhaps the most wretchedly aspersive race and gender scandal of recent times: the dramatic testimony of Anita Hill at the Senate hearings on the confirmation of Clarence Thomas as Supreme Court Justice. Yet even as the televised proceedings shocked and galvanized viewers not only in this country but the world over, they cast a long shadow on essential issues that define America. In Race-ing Justice, En-gendering Power, Toni Morrison contributes an introduction and brings together eighteen provocative essays, all but one written especially for this book, by prominent and distinguished academicians—black and white, male and female. These writings powerfully elucidate not only the racial and sexual but also the historical, political, cultural, legal, psychological, and linguistic aspects of a signal and revelatory moment in American history. TONI MORRISON is the author of ten novels, from The Bluest Eye (1970) to A Mercy (2008). She has received the National Book Critics Circle Award and the Pulitzer Prize. In 1993 she was awarded the Nobel Prize in Literature. She lives in New York. As Morrison (Jazz) writes in her pointed opening essay, the Thomas controversy last year both raised and buried issues of profound national significance. This collection . . . powerfully advances the debate . . . cordially but relentlessly lays out the legal history of the civil rights movement . . . describes the crisis in the response by black organizations, skillfully skewers the neoaccommodationist support of Thomas among black liberals . . . exemplifies James Baldwin's observation that white Americans don't know how to deal with a black who falls outside of their expectations. . . shows an example of how even militant feminists can be snookered when the issue is racial identity.